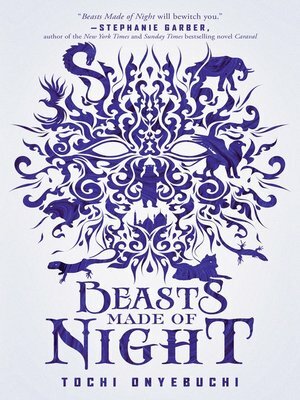 Black Panther meets Nnedi Okorafor's Akata Witch in Beasts Made of Night, the first book in an epic fantasy duology. In the walled city of Kos, corrupt mages can magically call forth sin from a sinner in the form of sin-beasts—lethal creatures spawned from feelings of guilt. Taj is the most talented of the aki, young sin-eaters indentured by the mages to slay the sin-beasts. But Taj's livelihood comes at a terrible cost. When he kills a sin-beast, a tattoo of the beast appears on his skin while the guilt of committing the sin appears on his mind. Most aki are driven mad by the process, but Taj is cocky and desperate to provide for his family. When Taj is called to eat a sin of a member of the royal family, he's suddenly thrust into the center of a dark conspiracy to destroy Kos. Now Taj must fight to save the princess that he loves—and his own life.